Oh I know I said I’d make the dating post today, but I told y’all not to hold me to it. And thank goodness! Today I was busy at work, so I didn’t have anytime for some on the sly blogging and I got squeezed in for a haircut. My ends were starting to get prickly and I knew last week I would need one and I called on Saturday and left a message and crossed my fingers. The stylist squeezed me in and now I feel so much better. Good hair health equals good mental health. I’m in this weird phase where I’m trying to grow my hair out for Locks of Love; it’s long enough, probably, but now that apparently everyone likes me so much better with long hair (which is awesome considering how long I had short hair…) I’m trying to get it pretty long so that way when I donate it, I’ll still be closer to shoulder length and I’ll be able to grow it back out quickly. It’s all very complicated, you see. The other complicated part? I decided to venture down bang street again. Oh my love/hate relationship with bangs. I generally like they way they frame my face, but I have days where I’m like, “What did I do!? !” This is normally because of the fact that sometimes my hair gets whispy and then my bangs get all sticky-uppy. And then there are times when I can’t get my bangs to go back and I’m all like, “Grow, hair!” And then sometimes they lay just right and life is parfait. And not dessert, the French word for perfect. Anyway, because of my supremely awesome haircut (oh, and I got my streak toned out, so all you haters can swig the last of your haterade) and a supremely awesome episode of Chuck, I ran out of time to blog. Because I moved to slowly. Get it, tortoise and the hair- eesh. Now time for a visual pun. 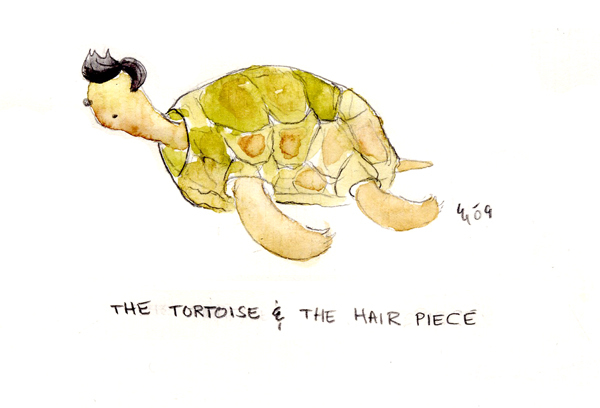 I found this image after googling “tortoise hair” and I loved the simplicity and softness of the water colors. This image is copyright the artist Charrow, but since I'm awful and this blog has no credentials, I didn't ask for permission... Hope I don't get in trouble! The artist, Charrow, has some really lovely stuff on her site. It’s worth checking out for some vibrant soft prettiness. Also, spoiler alert, some of the images feature cute doggies and kitties. Please go see! Tomorrow I’ll blog about what I need to blog about. Maybe.